Do you know how good a product has to be in order to have a 4.8-star rating from more than 1,000 reviews on Amazon? If not, it’s high time you found out. 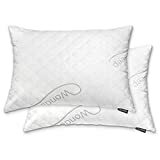 The WonderSleep Premium Adjustable Fill Shredded Hypoallergenic Memory Foam Pillows on Amazon are incredible. They’re super plush and comfy and yet they still manage to provide plenty of support. They cost $35 a pillow which is more than you’ll pay for bargain-bin pillows, but you have no idea how much better you’ll sleep once you get them.